CHICAGO -- A woman who dropped her infant daughter to her death from an eighth-floor window in Uptown so her parents would not know she was pregnant pleaded guilty and was sentenced to four years' probation. 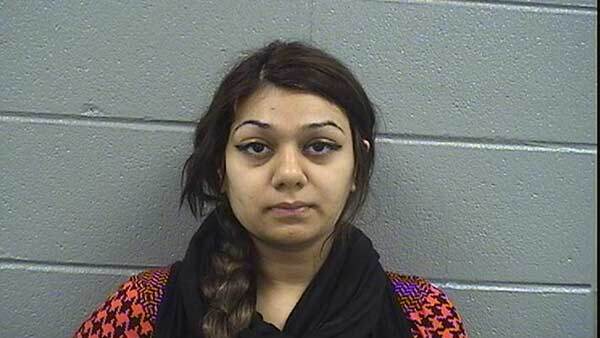 Mubashra Uddin, who was 19 when she was charged with first-degree murder in 2015, pleaded guilty Thursday to involuntary manslaughter, according to Cook County state's attorney's office spokeswoman Tandra Simonton. Judge Carol Howard sentenced Uddin to 48 months' probation and ordered her to pay a $579 fine. She was given credit for 603 days served in the Cook County Jail. On Nov. 11, 2015, the newborn was found about 11:15 p.m. in the yard of the building where the Uddin family lived in the 800 block of West Eastwood, according to Chicago Police. Uddin had dropped the infant from the window shortly after giving birth, prosecutors said. The naked, bloody, but still-breathing girl was found in a grassy area by a neighbor, who wrapped her in his shirt and blankets, then called paramedics. She was taken to Weiss Memorial Hospital, where she died about 90 minutes later, according to the Cook County medical examiner's office. Assistant State's Attorney Patrick Turnock said the infant had suffered skull fractures, a spinal fracture, broken left shoulder, fractured left and right ribs, and a lacerated aorta, as well as damage to other internal organs, prosecutors have said. An autopsy found she died of multiple blunt force injuries and ruled her death a homicide, the medical examiner's office said. At subsequent court hearings, Uddin's lawyers and friends said she was overwhelmed by the pressure of raising a baby as an unwed mother in a pious immigrant family. "At that moment she probably wasn't thinking and she cracked ... because the Mubashra I know wouldn't do something like this if she was in right state of mind," Uddin's childhood friend, "Nina O," wrote in a letter to Cook County Judge James Brown. "Standing before you is someone who is heartbroken and sad. ... She is a confused, older teenager," her attorney Barry Sheppard said at her bond hearing. "She's extremely contrite. She's saddened. She's been crying." But Judge Brown said, "Dropping a baby out of an eighth-story window to its eventual death is exceedingly evil and exceedingly cruel," and ordered Uddin held without bond. Last year, her bond was reduced to $275,000 and she was released on bail, subject to electronic monitoring. Uddin, a Muslim of Pakistani descent, hid the pregnancy from her parents because she thought they wouldn't approve, Turnock said. The only people who knew were her boyfriend-who her parents didn't approve of; and another friend. She hid the pregnancy by wearing baggy clothes and never sought prenatal care. Uddin gave birth to a 7-pound, 11-ounce girl in her bedroom at 11:20 p.m. while her 10-year-old sister slept in the same room, Turnock said. Minutes later, Uddin heard her mother approaching the room, so she opened the window, held the baby out head first and released her, according to the prosecutor. Police found blood on the floor and a window in the bedroom, and also found blood on the toilet, bloody sheets, bloody scissors allegedly used to cut the umbilical cord, and clothes that had been washed, prosecutors said. Uddin first denied being pregnant, but later made incriminating statements on tape, according to prosecutors. Sheppard said while Uddin was from a religiously conservative background, it doesn't mean her parents don't love her. They support her "100 percent," the attorney said. Uddin's father and mother never spoke about the matter, but appeared in court to support their daughter, the attorney said. A former school counselor described Uddin as a model student and a "sweetheart." Her boyfriend's mother said Uddin wasn't "in the right state of mind" at the time of the incident, adding the family was so "strict" they pulled her out of high school when they found out about the relationship with her son. She had attended DeVry University. Uddin received treatment for depression in Cook County Jail, according to Sheppard.